There’s a lot to love about this vibrant and carefully pitched picture book. Horrible Bear! is the story of a girl who is out flying her kite one day. The string snaps and the kite falls into the cave of a very big and very sleepy bear. He’s asleep and, awfully, manages to roll over on top of her kite and crunch it. 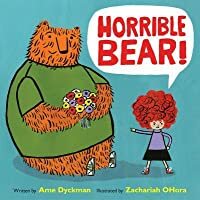 The little girl loses her temper and yells: “HORRIBLE BEAR!” She stomps home in that delightful full-body stomp of anger that small people do, and the bear is left to come to terms with what’s just happened. Naturally, he’s a bit upset as well and decides he’s going to be a HORRIBLE BEAR! Just as he’s leaving the cave and coming down the mountain to roar at the girl, the girl manages to break her beloved toy. Upon realising how horrible she’s been, she apologises to the bear who promptly helps her put her toy back together. Adorable, no? It’s a very charming and lovable story full with some pertinent and gently told messages. When it comes to picture books, everything matters. Everything. There were two words that glared a little for me from the text because they didn’t feel quite as universal as I’d have liked. I know, I know, I can hear you commenting on how picky that is and it is a picky comment. But it’s a comment that comes from the nature of picture books and my love for them and my want for them to reach out to a whole world of readers and to do that with a whole fistful of meaning and weight in each and every word. There’s nowhere to hide in a picture book and it’s right to acknowledge the slight down notes in an otherwise wonderful book because everyone gets better, always, and Dyckman and OHara are rather wonderful already. The dynamic art of HORRIBLE BEAR! is testament to that, as is that subtly written note of regret on the part of the girl. It’s easy to judge in books like this, to get all high-handed and moralistic, but Dyckman reins it back. Her language is precise, kind and subtle. It’s a great line to walk and one that speaks of a great understanding of children and of learning. Where HORRIBLE BEAR! absolutely shines is in its use of detail. This isn’t a story that forgets what’s happened to concentrate on the next page. It begins on the title page, where underneath the dedications from author and illustrator, a small girl with vibrant red hair sees the string on her kite snap. And then we’re in, pounding through a story where the bear sleeps with a little tiny teddy bear of his own, and when the girl gets back into her bedroom, we can see the bear coming out of his cave up the mountain through the window in her room. It’s so utterly lovely and smart that I can get picky with this book. I can get picky because it’s so vividly on point at certain moments that I want all of it to be up there, reaching the great heights of storytelling that it has the potential to do. This is vivid, exuberant, eccentric, and kind work. HORRIBLE BEAR! is rather wonderful. Just don’t forget that exclamation mark! My thanks to Andersen for a review copy.